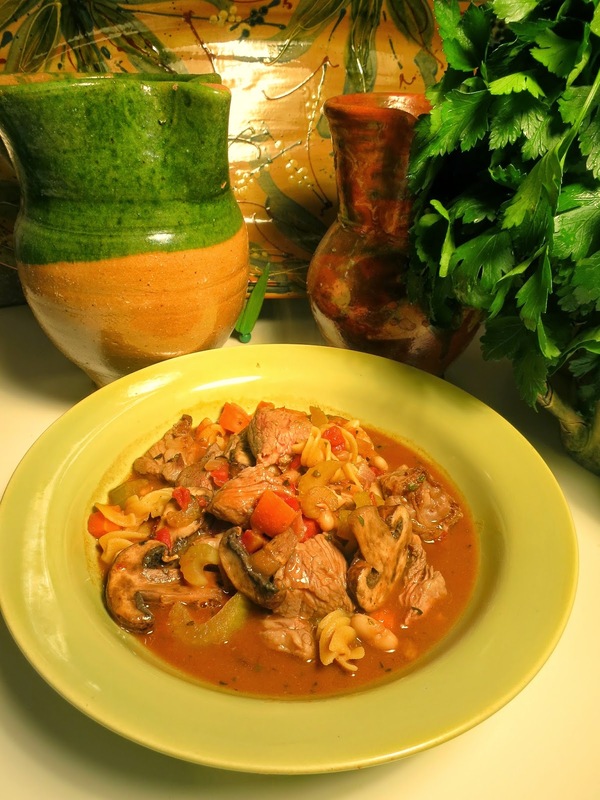 Abundance Wine Country: Is it a Soup or a Stew? Hearty soups and stews are on the menu this time of year. It always seems that when the first of the cold weather shows, our bodies crave the warmth of thick, warming and brothy dishes. So put on a sweater and slurp up some soup. This minestrone will keep you toasty. This is no soup for light-weights. Big chunks of meat, mushrooms and pasta make this almost a stew. This soup is a meal all on its own. Serve it alone, or add a green salad on the side if you wish. The grass-fed chuck I used was tender and delicious. Be sure not to overcook the meat and do not let the soup come to a boil once the meat has been added. Add the olive oil to a large soup pot and raise heat to medium-high. When oil is heated, add half the meat to the pot and brown and sear stirring for several minutes. Remove meat to a bowl while there is still some pink showing through. Do not overcook. Brown and sear the remaining meat. Remove and let sit. Add the onion, celery, carrot and garlic to the pan and cook until vegetables are turning soft. Add the 1/3 cup wine. Add the tomatoes and beef broth and bring to a boil. Lower heat to medium and cook for 10 minutes with lid on. Remove lid and add in the cannellini, mushrooms, spices and quinoa pasta. If the liquid seems to have cooked down and there is not enough broth, add the 2 cups of water. Cook about 8 minutes. Add the beef. Serve with chopped basil on top. This soup is perfectly delicious without any cheese, so don't feel like you're missing anything if you are avoiding dairy. If you're not, go ahead and sprinkle fresh grated Parmesan cheese into each bowl.